Ninjas, Kittens, Crafts: Want Tutorials? So, I wanted to clue you in on the two crafty things that I did discover this Christmas season. One, I've figured out how to turn my multitude of wrapping paper into paper bags. 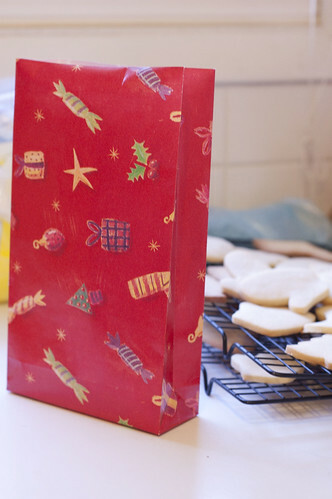 Not the most useful thing this year (except it works for cookie deliveries), but I suspect that when I have a child at grade school, it'd be neat to send in lunches made out of wrapping paper or such at Christmas time. Two, I finally learned how to make a damnable bow out of wired ribbon. 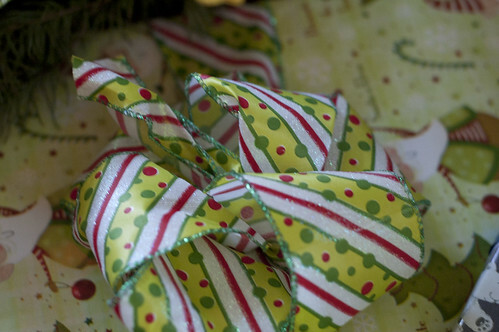 For years I've lusted after this ribbon, only to reject it, because it was nearly useless in my wrapping efforts. Now, I buy this ribbon ALL the time. That's my new Christmas wrapping rule. Any one want tutorials on either of these items? If so, let me know. I think I'd enjoy putting those online.